This time around, I’m keeping it simple. I’ve been getting bags of delicious new potatoes in my CSA box all summer long. While they aren’t up there among my favorite foods, I don’t dislike potatoes. Until last weeks batch, I don’t think I ever really appreciated them. 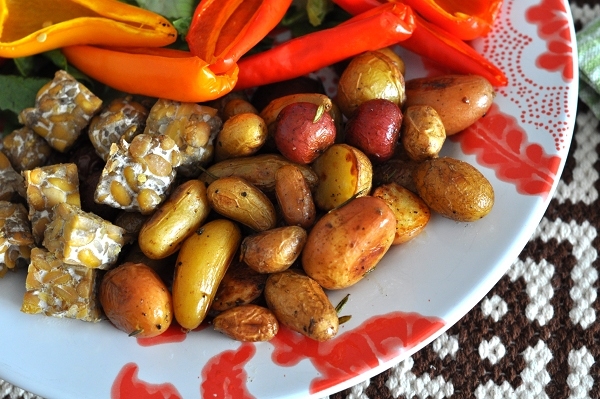 This simple recipe for roasting an assortment of tiny “Potatoes Détente” came from chef Jonathan Miller, who contributes recipes to Mariquita Farm‘s weekly newsletters. The medley of French Fingerling, Russian Banana, German Butterball, and Red Norland potatoes roasted up beautifully with a few springs of rosemary (also from my box), some olive oil, salt, and pepper. When I pulled them out of the oven their skins were perfectly crinkled, holding flavor I never imagined in a potato. The crunchy bits of rosemary only made things better. Every bite really did melt in my mouth! I could go on and on and on…but I won’t. These were the smallest potatoes I’ve ever seen. Described as “sort-outs” in the farm newsletter, I don’t know where you would ever get potatoes like this except directly from a farm. Now that I think about it, part of what made me love these so much is the potato skin to pulp(?) ratio: skins are my favorite part of any potato and with tons of tiny spuds you get more crackly, crispy skin! 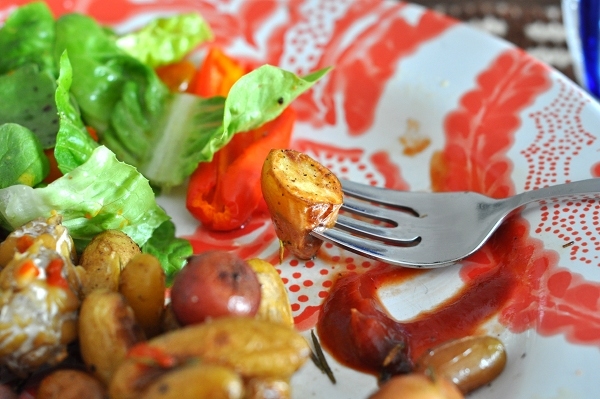 Roasted potatoes, tempeh (also roasted), and a salad. Spread potatoes and rosemary on a rimmed baking sheet or roasting pan (you can put slightly larger potatoes on their own pan. I just cut the handful of larger ones in half). Be sure they are not crowded. 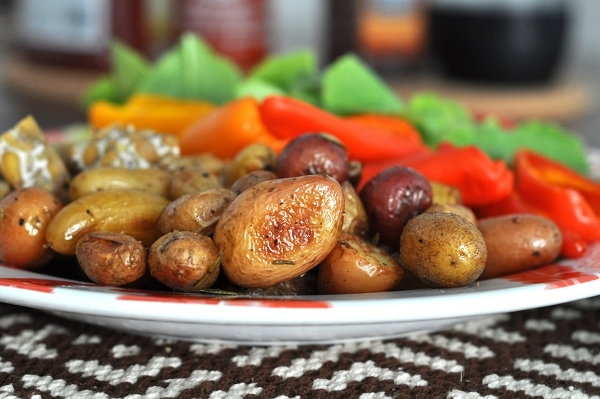 Sprinkled olive oil over the potatoes and stir them around until they are evenly coated. Place potatoes in the oven and roast until they are just cooked though. This will take about 30 minutes but start checking them at 20 to 25 minutes. Mine were perfect at 25.